In an electric atmosphere at Drouot on 14 December, an Imperial seal from the Qianlong period achieved a record €21 M (Pierre Bergé Associés): the highest auction price achieved this year in France for an objet d'art. Largely relayed on China's messaging app WeChat, with its 800 million-odd users, its sale to a Chinese collector created a strong sense of national pride. Much the same happened a few hours later at Christie's Paris, when a gilt-bronze Vairocana Buddha from the Liao dynasty levitated up to €13.3 M. Splendid hammer prices that confirm the French capital's position in the Asian art market, and contribute to the rosy health of national auction houses – whose end-of-year results were decidedly heartening, with an average rise of 5% to 10% for the leading trio, Christie's, Sotheby's and Artcurial. 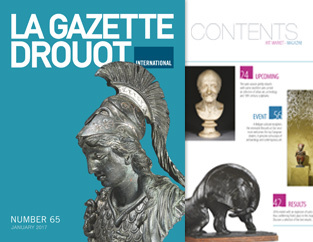 Meanwhile, Drouot and its 75 affiliated auction houses boasted a result of €370 M and the creation of a new international online sales platform: Drouot Digital. The Paris market can thus move serenely into 2017, with renewed confidence. Let's hope this year will be as rip-roaring as the Ferrari sold to an American buyer for €32 M by Artcurial in February: the year's top auction price in France regardless of category. Happy New Year! The sales season gently restarts with some excellent sales aimed at collectors of urban art, archeology and 18th century art. Two remarkable busts, one of Athena (Pierre Bergé & Associés) and the other of Voltaire by Jean-Antoine Houdon (Muizon Reunier), make sculpture the real star of the beginning of this year. As for the Old Masters, they can be found in New York for a journey through Spanish painting. On his way through Paris, the city he particularly loves, Arne Glimcher – not only the founder of the Pace Gallery in New York and Beijing but also a producer and film director – talks about his successful career, developments in the international market and the place of art in society. 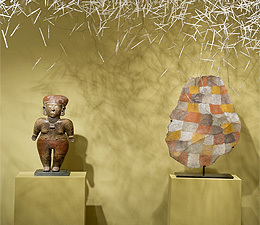 For Arne Glimcher, art is still a religion and minimalist artists the only true gods he believes in! His stand will be one of the focal points of the next edition of the famous major interior design show, the Maison&Objet exhibition (Paris). A regular at the event, Pierre Charpin has now – finally! – been acclaimed "Designer of the Year". A Holy Grail of a title, which loudly proclaims what people have been murmuring quietly for a while: Pierre Charpin is surely one of French design's most subtle representatives. As her first London exhibition gets under way, the French artist Fabienne Verdier meets us in her den: a place of shadow and light far away from the busy outside world. In a village near Paris, with a touch of the English countryside, time seems to stop. This is where Fabienne Verdier decided to live and work on her return from China… A place that fits well with her painting: monumental.